Some may say I’m a hoarder. I feel I see potential in things that others view as trash. I definitely wouldn’t classify these items as treasure…yet, but after I get to them sometimes they are treasured. My father and Grandma instilled these values. Make Do and Mend will be a new category on this blog and ongoing posts about how I take something and make it lovely again or useful once more instead of chucking it and buying a new version. 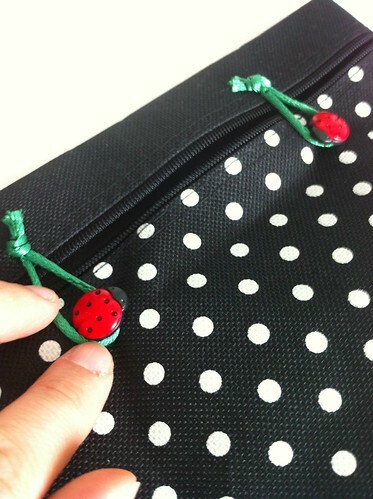 To kick things off, this was a quick little project that transformed a bag with a broken zipper. Sure, I could have replaced the zipper, but I was short on time and wanted to send this as a gift to a friend right away. 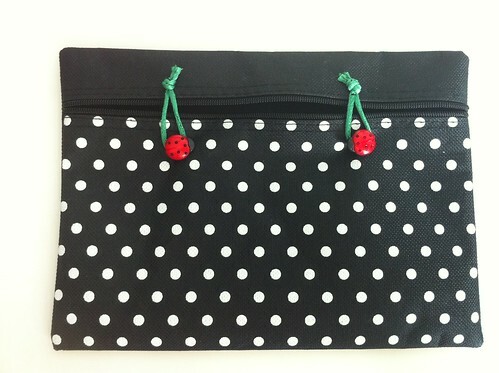 So, I ignored the zipper and left it there, but embracing the dotted nylon fabric of the bag, I chose two ladybird (aka ladybug) buttons to adorn the front and allow it to close in spite of the broken zipper. 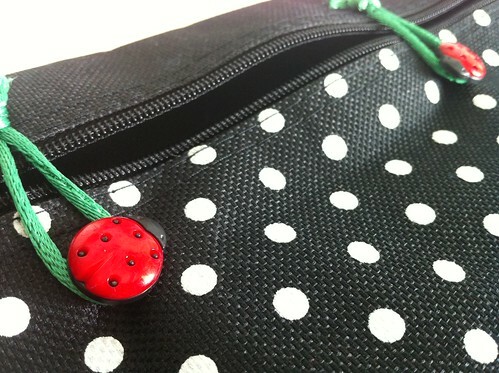 I chose bright grass green satin cord for the closure loops to contrast the red ladybirds and bring a bit of nature into it. The loops ended up being a bit leaf shaped so I like that the ladybirds have a leaf to rest upon. How did I do it? Here goes! 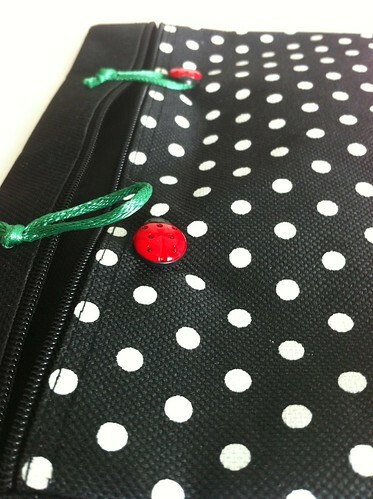 I spaced the two ladybird buttons evenly on the front. I sewed the buttons on. Then I measured the length the loops should be for proper tension and ease to connect them with the buttons. I sewed through each knot to secure the loop to the top side of the opening. After the first stitch, I double checked the length to make sure the loop and button could pair up. It worked so I continued with securing the loop knot with several more stitches. I repeated this on the second loop. That’s it! And in less than 30 minutes what could have been thrown away ended up being cuter than its original existence! What have you done to avoid replacing a zipper? This entry was posted in Make Do and Mend, Sewing | Embroidery, Tutorials | Patterns.